Beltany Stone Circle is an impressive megalithic site located in County Donegal, in the Irish province of Ulster, and is one of Ireland’s largest stone circles. Thought to have been erected during the late Bronze Age (1400-800 BC), mystery remains as to what the ancient structure was used for, but it is believed to have been associated with religious rituals which included observations of the sun and moon. The discovery of a sculpted stone head dating to centuries after the construction of the circle suggests that this monument remained a place of ceremonial activity for hundreds of years after it was first built. Beltany is located just to the south of Raphoe, a town in County Donegal. The name of the site is said to have been derived from ‘Bealtaine’, the fire festival celebrated by the Celts , and known also as May Day. Traditionally, the Festival of Beltaine or Beltane was celebrated with the lighting of bonfires on the top of hills, and the movement of livestock to summer pastures. These celebrations were believed to ensure protection, as well as to guarantee a good harvest for the year. It has been suggested that the name of the site is an indication that the site’s function as a pagan ritual centre had survived in the folk memory of the local population. 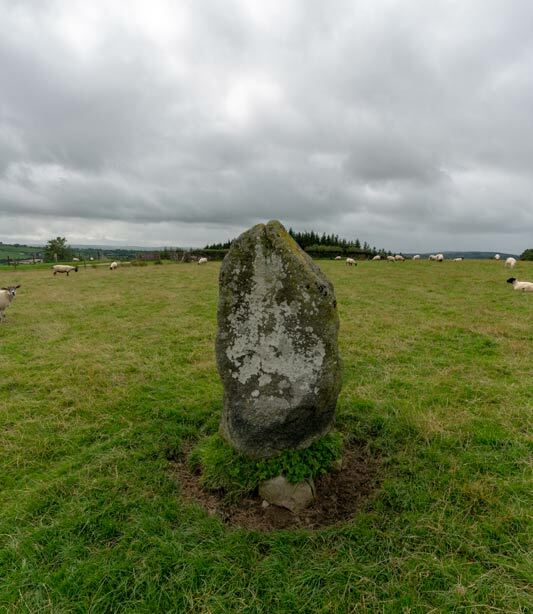 The Beltany Stone Circle consists of 64 standing stones, though it has been reported that the circle once had over 80 stones, and an outlier stone, i.e. a standing stone outside the stone circle, that stands at a height of almost 2 m (6.6 feet). 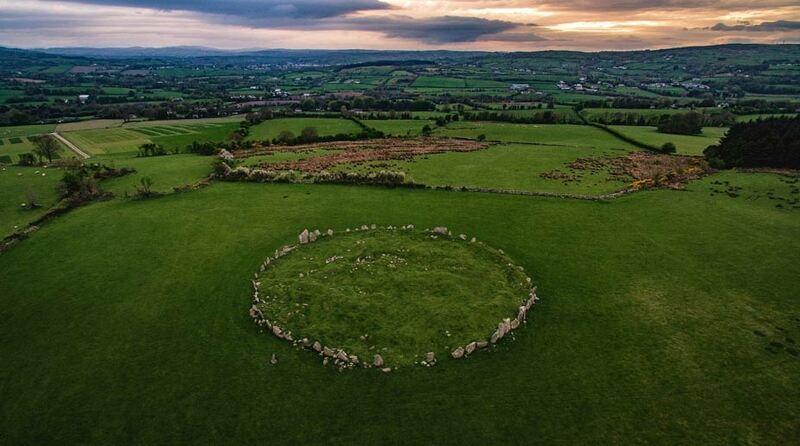 With a diameter of 44.2 m (145 feet), Beltany Stone Circle is larger than most of Ireland’s more than 240 stone circles. An explanation as to how the stone circle came into existence is provided by local folklore. According to a local legend, the stones of the circle were once human beings. They had been turned to stone, however, as a punishment for dancing on the Sabbath. As for the outlier, this is said to have been the musician who was playing for the dancers. A less romantic, though perhaps more plausible explanation for the stone circle’s construction is that it was used by the ancient inhabitants of the area for the observation of astronomical alignments such as the winter and summer solstices. Another indicator of Beltany Stone Circle’s role as a ritual site is the discovery of a sculpted stone head close to the stone circle, which was probably carved in the pre-Christian Iron Age (400BC-400AD). It has been speculated that the stone head may have been a depiction of a Celtic deity, and that it was venerated as an idol. Incidentally, this sculpture, given the name ‘Beltany Stone Head’, is now part of the National Museum of Ireland’s collection, and is one of seven stone heads (collectively known as the ‘Raphoe Group’) found in the area. The Beltany Stone Circle may have once been part of a funerary structure, although it is unlikely to have been its original purpose. In the centre of the stone circle is a mound or tumulus. The number of stones that form the tumulus has been regarded as a sign that it may have once served as a burial cairn. If so, then the stone circle would in fact have served as the kerbing of the cairn. Alternatively, it may have been a passage grave dating to the Neolithic period. In any case, there is a lack of further evidence supporting this interpretation, for instance, human remains, or grave goods, though it has been suggested that the grave may have been pillaged in the past. Arguably the most enigmatic stone in the circle is a large triangular slab with at least 43 cupmarks facing the inside of the circle. There are also three or four more megaliths with these strange marks. It is unclear as to what the function of such stones, but they may have simply been a form of artistic expression.